This .30-06 Springfield ammunition is an inexpensive way to shoot this notoriously costly cartridge. 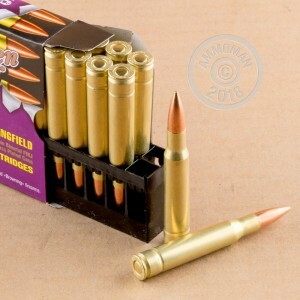 Manufactured in Russia by the Barnaul Machine Plant, a longtime supplier to the Soviet and Russian armies, these cartridges fire a 145 grain full metal jacket bullet at 2,791 feet per second. Barnaul's "Golden Bear" ammunition uses brass-plated steel cases which are not reloadable but cycle effectively in the vast majority of firearms. 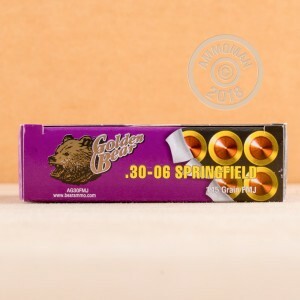 Golden Bear ammo uses non-corrosive Berdan primers.